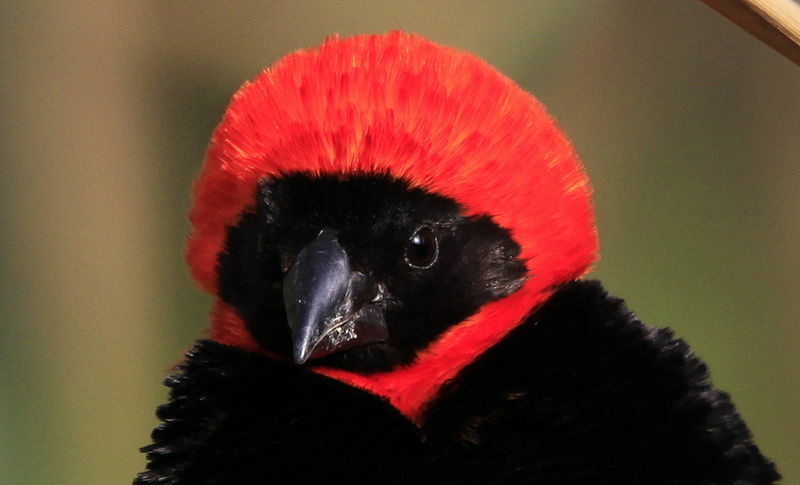 As with so many bird species only the male Southern Red Bishop Euplectes orix wears the bright red cap and jet-black vest, and then only when trying to convince a female to take up residence in one of his nests. At rest be may look like a senior cleric about to take part in a convocation but in in flight he whirs and bustles about the reedbeds like a large bossy bumble bee. The genus name means ‘well-woven’, a reference to the tightly woven nests typical of weaver birds, while orix, is from the Greek word for rice, possibly a reference to the bird’s mainly seed diet. In fact, such are the species’ numbers and their predilection for seed crops, that wheat farmers often see them as pests.